If you're not careful when you go to drill out your gun barrels, you can damage them beyond repair. Here's how you can fix that if you find yourself in this very situation. As part of a project I was finishing up, I ended up getting a few models that had damaged gun barrels. It doesn't take much either, a slight misalignment of the hobby drill and the next thing you know, you're accidentally drilling out the side of your barrel and you've ruined the whole bit. The best way I've found to fix this is to simply make a new gun barrel and glue it in place of the damaged one. It's not as hard as you think and you don't need anything more than you've probably already got lying around on your hobby desk. You'll need a few things to pull this one off. The only thing not shown in the picture above is superglue. The X-Acto blade needs to have a new, sharp blade for this to work best. The drill is the standard GW drill. The greenstuff is a previously cured roll that I made beforehand. I deliberately made it for this project in the same diameter as a bolter/bolt pistol gun barrel so I could use it for this very thing. There is a sequence to doing things so you can make it as easy as possible. I've found that if I try it other ways, it tends to become a little more difficult as I go along. The overall idea is to keep as much stability in the greenstuff as long as possible while you're drilling and cutting away at it. The first step is to cut one end of the greenstuff flat. This will be one end of the new gun barrel. Make sure it is nice and flat and not at an angle. This is where the file comes in for fine tuning the surface. The second step is drilling the cross hole in the barrel. This is done with the drill bit just a tiny fraction of space back from the cut end of the greenstuff roll. Leave no more space than you want on the finished barrel here. It will be close to the edge, but if you're careful, you'll be fine. Take your time when drilling and go slowly. That way, you get a nice, clean hole in the end. The greenstuff can be tricky so you'll need to just keep at it until you get a nice cross hole through the barrel. The third step is to cut the other end of the barrel (the side that will mount to the weapon itself). Cut this close to side port so that the port is centered on the new length of barrel. You want this to be nice and square as well so that you get a clean, smooth, flat surface to glue to the gun itself. Use the file as needed again. Last is gluing the new gun barrel to the previously cleaned up weapon front and finish it off by drilling out the muzzle itself again. Worst case scenario... you mess it up once again and have to start all over. The best thing though is that you don't lose the use of the entire bit because of a damaged gun barrel. 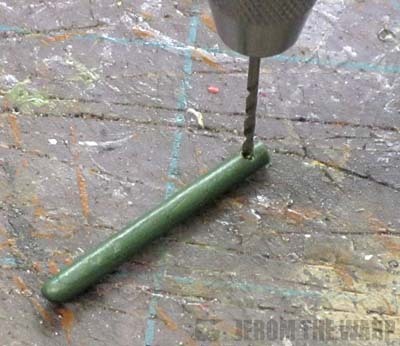 In the case of something like a heavy bolter, it's a matter of rolling out a larger piece of greenstuff to work with and drilling larger holes. 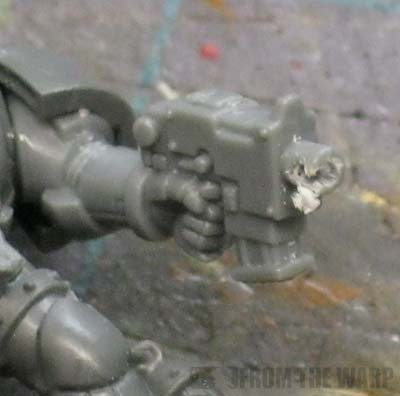 With something like a storm bolter, you just do two of the smaller barrels and glue them side by side for the old school look. I used lollipop sticks to beef out my Advanced Space Crusade scouts bolt pistols. Totally bada$$ muzzles bigger than bolters, they look awesome amd I got sweeties too! Styrene tube would be ideal for this, though it's harder to cut straight. There *is* however a technique to scoring and cutting styrene tube. Ron, I think this is a great idea for a series of occasional posts ... where you address how to fix common hobby mishaps. Atreides: A very good point. I've gone with greenstuff since it's something I figure most all of us already have. Trying to find/order the correct size plasticard tubing for just one gun barrel might be a bit much for some folks. Would plasticard tubing work? Absolutely. dwez: Another good solution and like you said, you get treats too. Anon: Yes, scoring helps with the plasticard and you may need to burnish the edges to remove any raised portions, but it is an option... especially if you have the correct size handy because you use the stuff regularly. Anon: Occasional would definitely be the word for it. I tend to post these as I come up with them because I've come across a problem in my modeling. I use Plastructs Plastic Weld for working with GW models. It's the real deal, not your standard whimpy model glue. It also does a great job of blending greenstuff sanding lines. Like all those little green stuff fuzzys and discolored sections from sanding and drilling. It'll melt those away without damaging the sculpting leaving you with a smooth sculpt. LuckyNo.5: Never heard of the stuff. Sounds like it does a great job cleaning up the smaller imperfections though as you say. You can see how smooth the straps on the heads and the spine detail look. I used it there. Ron: it's a pretty strong plastic solvent that's required for the type of plastic that Plastruct uses (which is different from what your normal model kits use). It's essentially slightly knocked down acetone. Which also works beautifully for the fuzzies, etc, but you have to be careful to apply sparingly. daft question - but how do you get the roll the right width? is there a secret or is it just practice? Aside from the odd bit of filling i confess to being a total greenstuff noob. and i've messed up enough gun barrels to need this tip! In the past I have cut the barrels from spare bolt pistols or boltguns to do the same repair. Maybe a bit easier for some (I for one seem to lack the "skillz" with the greenstuff) to pull off. Great article though, this seems to happen to all of us at one time or another. LuckNo.5: Some very nice work there. I can see what you mean now. Jake: If it's that strong, I think I'm going to pass on trying to use it in the house. Does it have an odor or need to be used in a ventilated area? Matt: Not a daft question, a very good one actually. Once you have your greenstuff mixed, you pull off a bit that you want to roll out. You can get it started between your fingers, but when I want a super smooth tube of it, I'll use two CD covers and roll it out between them. You keep applying pressure and rolling it back and forth until you get it the thickness you want. If you have a spare bolt pistol lying about, you can set it down next to your greenstuff to compare the sizes. It doesn't have to be absolutely perfect, close enough should be all you need really. Tony: That works too as long as you have the spare ones lying around. But that ultimately kills two bits trying to make one. Ron: I like that approach, never thought of that to get out of a bind. Considering all the scratch building I have done over the years I have a stack of plastic tube laying around. Bolters/Heavy Stubber Barrels are approx 2.3mm in diameter. The closest size Round Tube from Evergreen is Pack #223 with OD size 2.4mm. 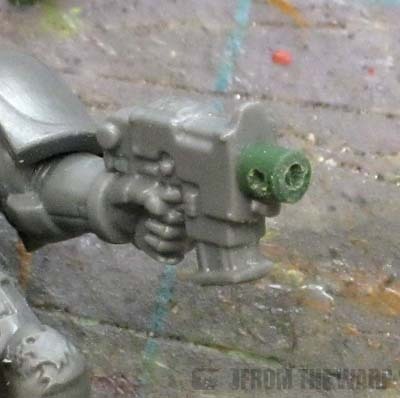 Heavy Bolter barrels are approx 4.25mm. The closest size Round Tube from Evergreen is Pack #225 with OD size 4.0mm. Cheers for the tip mate! Da_Sub: Excellent Stuff! Thanks for sharing! Uses a drawing pin, needle, compass point or anything that is easy to grasp and has a sharp point to make a pilot hole in the barrel. If you get it off centre try again until it's right. 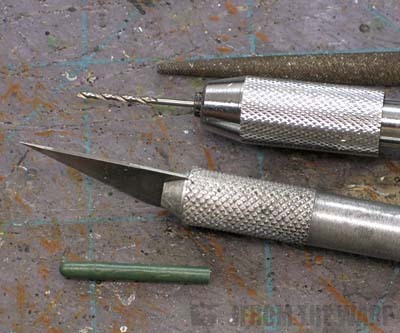 Then drill it with a small drill bit and then drill it with a slightly larger drill bit. The succession of pilot holes means you should never go wrong and damage the barrel. To make this a fairly speedy process I have two pin vices with the drill bits I need so I don't need to waste time switching them over. Glenn More: I use the tip of my X-Acto blade myself to get a small pilot hole. I really only use a succession of holes when I'm drilling out the larger gun barrels. If you just drilled it off-center,fill the hole with superglue and sand when dry. Will Wright: Oh... never heard that one before. I like that idea especially if you're still in the pilot hole steps and the hole is small. Very nice. @Ron: Really smart post; genius, really. @Da_Sub: So going to build myself a mitre box. Thanks for the link!